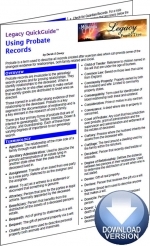 The Using Probate Records Legacy QuickGuide™ contains useful information including terminology and research strategy. Also included are links to websites and resources covering probate records and different record types. This handy 4-page PDF guide can be used on your computer or mobile device for anytime access.